45. Kuril Islands. The World Atlas. Plan of the Kurile Islands. Plan of La Baie de Langle. Partie du Japon. Asie 49. Partie de la Russie d'Asie. Asie 36. Ice Chart, Okhotsk Sea Region, August. Ice Chart, Okhotsk Sea Region, June. Ice Chart, Okhotsk Sea Region, March. Ice Chart, Okhotsk Sea Region, January. Ice Chart, Okhotsk Sea Region, November. Ice Chart, Okhotsk Sea Region, October. Ice Chart, Okhotsk Sea Region, February. Ice Chart, Okhotsk Sea Region, December. 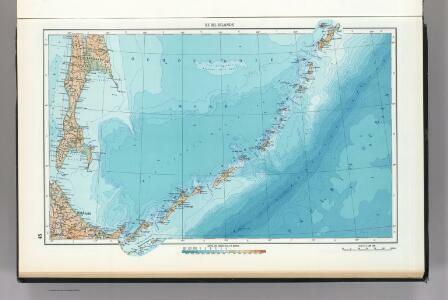 Ice Chart, Okhotsk Sea Region, May. Ice Chart, Okhotsk Sea Region, July. 1 : 8553600 Fullarton, A. & Co.